The aim of this pilot study was to investigate the changes of circulating epithelial cells in the blood of patients with differentiated thyroid cancer after radioiodine-therapy with I-131. The cells were detected by fluorescence-microscopy via the epithelial-cell-adhesion-molecule (EpCAM), a molecule described to be over-expressed in most carcinoma tissues and also present on circulating cells deriving from primary site. Epithelial cells were assessed before radioiodine-therapy, as well as 2 days, 14 days, and 3 months after therapy. 2 patient groups were examined: 1) patients with thyroid cancer receiving a first radioiodine-therapy after thyroidectomy (RITfirst, n=13), and 2) patients with thyroid cancer in need of repeated radioiodine-therapy due to local or metastatic recurrences (RITrep, n=15). Circulating epithelial cell changes were correlated to changes of serum-thyroglobulin and to clinical response evaluated 3 months after therapy. Patients with an early decrease of cells after radioiodine-therapy (RITfirst 7/13; RITrep 2/15) showed an increase of serum-thyroglobulin in most of the cases (RITfirst 5/7; RITrep 2/2). 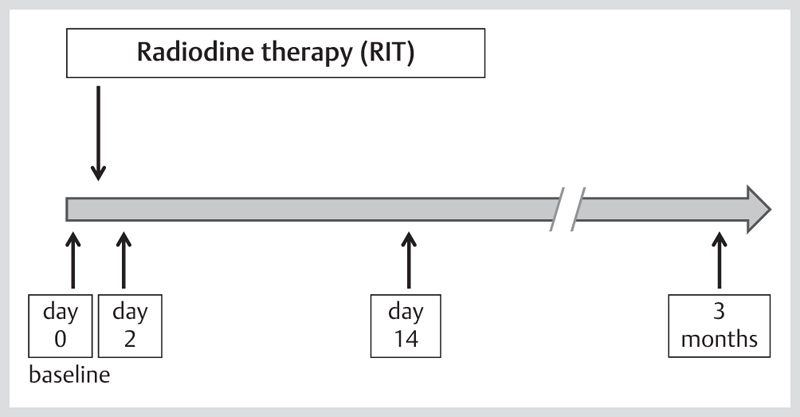 In the RITrep group, a decrease in cell counts 2 days after radioiodine-therapy indicated a clinical response in 90% of the cases. This study indicates that the number of circulating epithelial cells in differentiated thyroid cancer undergo changes in response to radioiodine-therapy. The destruction of cells through radioiodine-therapy may induce a short-term release of thyroglobulin in the blood. A clear relationship between the clinical outcome and the cell changes could not be found, but early cell decreases may help identifying patients more likely to respond to radioiodine-therapy. Radioiodine therapy (RIT) with I-131 is a standard method for the treatment of differentiated thyroid carcinoma, enabling the successful ablation of thyroid carcinoma cells. As a systemic form of treatment, RIT has the major advantage of reducing the risk of local recurrences as well as distant metastases . RIT can also serve as diagnostic tool, allowing the visualization of normal and carcinomatous thyroid tissue by means of whole-body scintigraphy. Furthermore, the complete ablation of normal thyroid tissue via targeting of iodine-avid cells allows to use the increase of the thyroid-specific protein thyroglobulin as a tumor marker . The success of RIT, whether as first or repeated therapy, is usually monitored within 3–6 months after therapy by means of whole-body scintigraphy, ultrasound scan of the neck region, and serum levels of serum thyroglobulin (sTg) . Due to the protracted efficacy and long half-life of I-131 (8.02 days), clinical manifestations of therapy effects cannot be expected at earlier time points. Therefore, there is a need to identify candidate markers for an early prediction of the therapeutic response to RIT. In some tumors, the identification of circulating tumoral cells in the blood may represent a potential marker of therapy response. Metastases are the result of systemic dissemination of cancer. The process of metastatic spread consists of entry of carcinoma cells in blood circulation, followed by egress of cells from circulation into the sites of metastatic formation . The epithelial cell adhesion molecule EpCAM (CD326) has been found to be overexpressed not only locally in the tissue of nearly all types of carcinomas, but also in circulating tumoral cells originating from the primary tumor   . In breast and bronchial carcinoma, for example, EpCAM-positive circulating epithelial cells (CEC) can be identified by means of fluorescence-labeled antibodies directed against the membrane-bound EpCAM; also, the presence and increase of these cells in the blood of patients with carcinoma can be interpreted as a sign of recurrence   . However, the demonstration of CEC is not carcinoma-specific, since these cells can also be found in benign diseases . In a previous study, we have demonstrated that CEC can be found in patients with different thyroid diseases, and that the number of CEC was particularly elevated in patients with differentiated thyroid carcinoma who had undergone recent thyroidectomy . However, only a single point in time was studied in each patient group, therefore there was no information on the time course of the therapy-induced changes. Indeed, studies in other carcinoma entities have shown that the time course of CEC levels during antineoplastic treatment correlates with the clinical response to treatment  . The present study was undertaken to investigate whether and how the numbers of CEC respond to RIT in patients with differentiated thyroid carcinoma. 2 types of patients were considered for this study, i. e., those undergoing a first RIT after thyroidectomy (thus having thyroid remnants primarily of non-malignant nature) and those undergoing a repeated RIT because of tumor recurrences (thus having thyroid tissue of predominantly carcinomatous nature). 2 early time points post RIT (day 2 and day 14) and one later time point (3 months), the latter in parallel with routine clinical assessment of therapy response, were chosen for comparison to pretreatment levels. 28 patients were enrolled in the study after approval of the local Ethics Committee. The patients were divided in 2 groups: 1) Patients recently subjected to thyroidectomy (4–6 weeks) and with histological diagnosis of differentiated thyroid carcinoma (DTC); these patients underwent a first RIT with activities between 2 and 11 GBq (54–297 mCi), in order to ablate the residual thyroid tissue (mostly non-carcinomatous) (RITfirst, n=13); and 2) Patients with evidence/persistence of differentiated thyroid carcinoma tissue, due to which they received a repeated RIT with activities between 5.5 and 15 GBq (RITrep, n=15). In the RITfirst group, patients of different TNM stage were included, ranging from T1aN0M0 to T4N1bM1. In the RITrep group, 2 patients were initially staged T1N0M0, the remaining patients’ staging were T2 or 3 N0 (except for 1 patient) M0 (except for 1 patient). The number of CEC was assessed at 4 time points: the day before the administration of I-131 (baseline value), 2 and 14 days post treatment, and finally 3 months afterwards ([Fig. 1]). Blood samples were collected in parallel for the determination of sTg levels. This schedule could not be completed in all patients, i. e., 5 patients of the RITfirst group and 6 patients of the RITrep completed only 3 time points. Fig. 1 Schematic representation of the assessment schedule. A 3-level evaluation of the therapy response took place 3 months after RIT by means of: a) whole-body scintigraphy (scintigraphic evidence); b) sTg levels (laboratory evidence); and c) ultrasound of neck region and/or imaging of the affected region, via low-dose computed tomography (CT) or magnetic resonance imaging (MRI) (morphological evidence). The preparation and count of CEC proceeded according to an established method   . One milliliter (ml) of whole blood in ethylene diamine tetraacetic acid (EDTA) was subjected to erythrocyte red blood cell lysis using a solution of 100 mmol/l KHCO3, 1.55 mol/l NH4Cl, 1 mmol/l EDTA in distilled water. This suspension was centrifuged for 10 min at 1 200 rpm to separate the cell fraction from the plasma. The cell fraction, mostly consisting of leucocytes but also containing CEC, was resuspended with 500 µl of PE (PBS buffer [phosphate buffered saline] with 2 mmol/l EDTA) and 20 µl of this suspension were exposed to a murine fluorescence-labeled antibody directed against EpCAM (EpCAM-fluoroisothiocyanate [FITC]). In parallel, the cells were also stained with 7-amino-actinomycin D (7AAD), a marker of cell viability, provided that only viable CEC were considered for further analysis. After 30 min of incubation, the cell suspension was transferred to a well of a 96-well-plate and investigated using a half-automated fluorescence microscope (Scan_R, Olympus, Munich, Germany). 2 wells, and therefore 2 independent measurements were performed for each patient. Cells were regarded as vital CEC when exhibiting a strong EpCAM-FITC-signal and lacking accumulation of 7-AAD within the nucleus ([Fig. 2]). The mean value of the 2 measurements was used for further analysis. This method allowed a reliable count of the number of CEC per milliliter of blood. Fig. 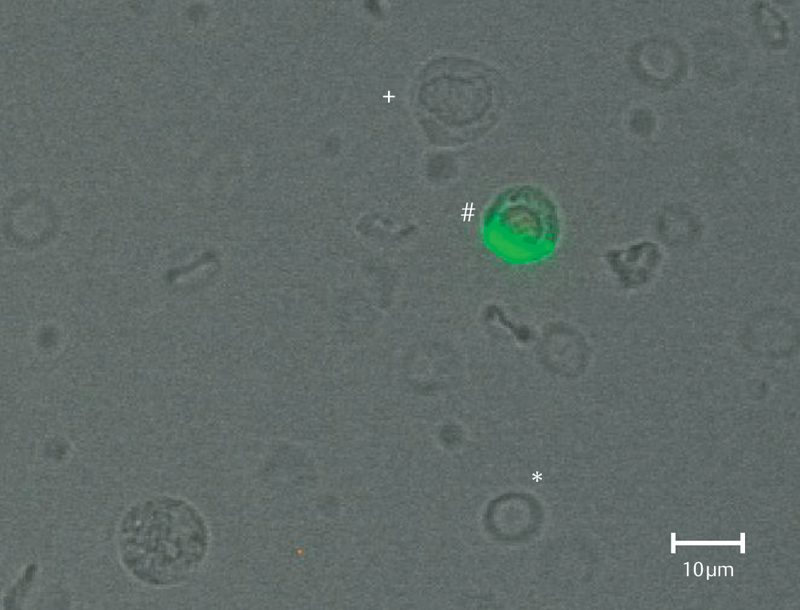 2 Fluorescence image of a circulating epithelial cell (CEC) (#). The clear signal (green) generated by the epithelial cell adhesion molecule (EpCAM) coupled to fluorescent isothiocyanate (FITC) indicates that the cell is of epithelial origin. 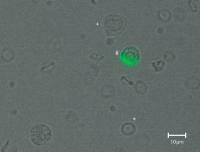 Cell fragments, debris of lysed erythrocytes (*) and non-stained leucocytes (+) are also visible. Instead of using absolute CEC values of individuals or their means within groups, the therapy response was estimated on the basis of the CEC numbers before RIT (set to 100%) and the percent change of CEC numbers at the chosen time-points post RIT in comparison to baseline. This procedure based on relative changes allowed the comparability of the time-course changes between individual patients, because CEC levels may differ much between individuals . Thus, the influence of outliers was minimized. In addition to the mean percent changes of CEC within each group, the data were also analyzed as categorized pattern of response (decrease or increase of CEC) within each group at each time point, in order to depict the course of therapy response in individual patients. The same general procedure was adopted for sTg levels. Statistical analyses were performed using SPSS 19.0 (SPSS Inc., New York, NY, USA). Group differences were tested by means of the Mann-Whitney U test. Correlation analyses were performed by means of the Pearson correlation coefficient. The significance level was set at p≤0.05. Data were presented as means±standard deviation (SD). Mean values and standard deviations of absolute CEC numbers of RITfirst and RITrep are shown in [Table 1] for each time point separately. Table 1 Mean values±standard deviations of CEC/ml of RITfirst and RITrep at each time point. The mean age of the RITfirst group was 57.6±12.3 years. At the 3-month check post RIT, from a clinical point of view, none of the patients showed signs of disease progression (scintigraphic, laboratory-wise, or morphologic) ([Table 2]). One patient was lost to follow-up at the 3-month check (data not shown). Table 2 Clinical response of the RITfirst and RITrep patients as assessed via sTg measurement, whole body scintigraphy and morphologic imaging (i. e. sonography, CT or MRI). The diverging total number of patients is due to a lost to follow-up. The mean age of the RITrep group was 61.6±15.2 years. At the 3-month check post RIT 2/15 patients (13%) scintigraphically showed disease progression. In terms of sTg levels and morphologically also 2 patients showed a progression ([Table 2]). In one patient, sTg measurement could not be performed. In terms of numbers of CEC, at day 2 approximately half of the patients receiving a first treatment (RITfirst) showed a reduction or an increase of CEC. 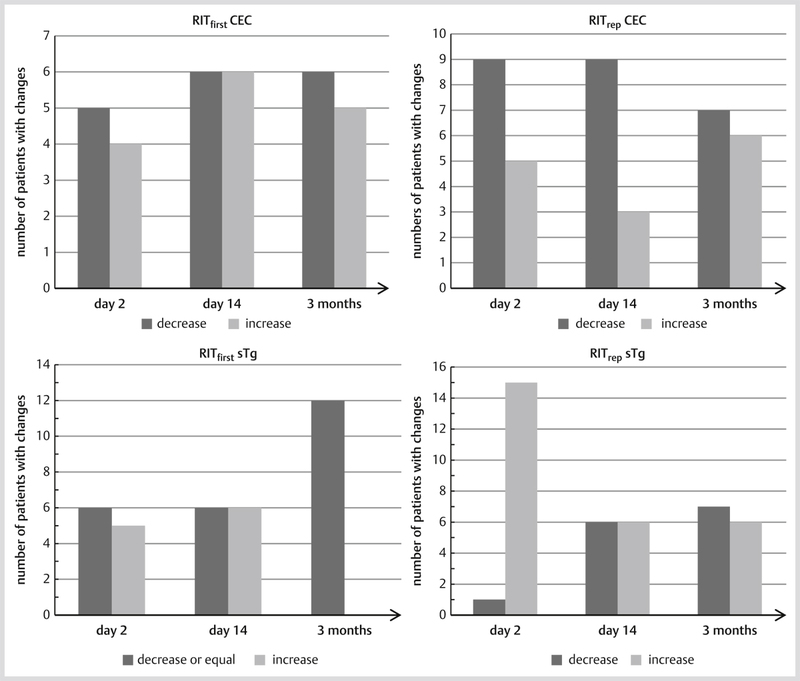 This pattern of response remained similar at day 14 and at 3 months ([Fig. 3]). Fig. 3 Number of patients with changes of numbers of circulating epithelial cells (CEC) and levels of serum thyroglobulin (sTg). Patients with differentiated thyroid carcinoma (DTC) received a first radioiodine therapy post thyroidectomy (RITfirst) or a repeated RIT (RITrep) due to local persistence or metastatic recurrence of the DTC. Differently from the RITfirst group, in the group of patients undergoing repeated RIT (RITrep) more subjects showed decreased numbers of CEC at day 2 and 14 (9/14 [64%] and 9/13 [69%], respectively). 3 months after therapy, the proportion of patients with reduced and increased CEC numbers was basically similar (7/13, 54% and 6/13, 46%, respectively), at this time in analogy to the pattern observed at all time-points in the group of patients undergoing a first RIT ([Fig. 3]). The sTg changes did not match the pattern of CEC changes. In the RITfirst group, for example, similar proportions of patients responded with an increase or a decrease of sTg at day 2 and 14. At 3 months, all patients responded with a decrease of sTg levels or stable conditions with sTg not detectable ([Fig. 3]). In the RITrep group, in contrast, at day 2 post RIT nearly all patients (15/16, 94%) showed an increase of sTg levels. At day 14, half of the patients (6/12, 50%) showed an increase and half of the patients a decrease of sTg levels. This proportion (basically half and half) remained evident at the 3-month time point ([Fig. 3]), similarly to the relative proportions of CEC cells at this time point. The response to RIT was analyzed also in terms of percent change of CEC numbers and sTg levels. In the RITfirst group, approximately half of the patients showed an increase of sTg levels to >250% at day 2 or 14 (7/13 patients, 54%). In 5 of these 7 patients (71%), in contrast, there was either a reduction of CEC to less than 60% or of at least 950% points after an initial increase (see representative cases in [Fig. 4]). Fig. 4 Time course of percent changes of CEC and sTg in the RITfirst group (mean±SD; upper left panel). On average, the time course was fairly parallel for the 2 parameters, especially in consideration of the large variability of the data. 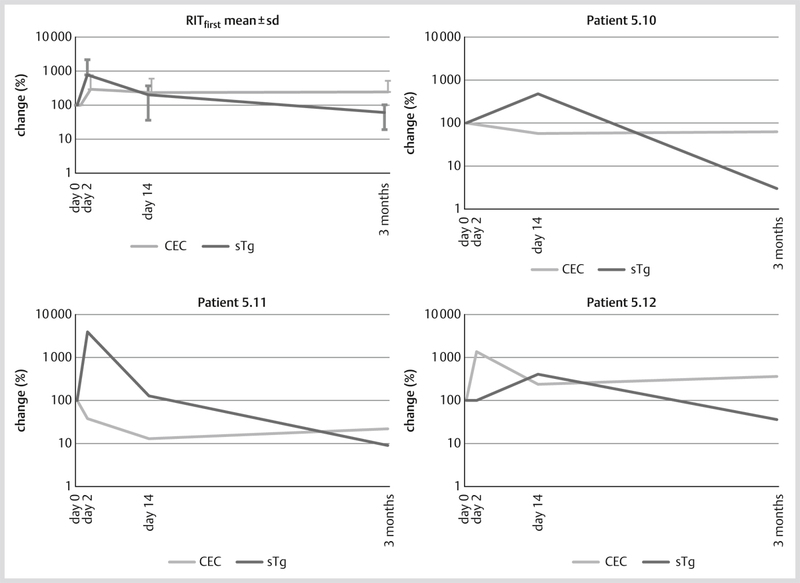 In contrast, the other panels show representative patients with clearly diverging results at 1 of the 2 short-term time points (sTg increase to >250% of baseline levels, CEC decrease to <60%, or, in the case of Patient 5.12 decrease of >950% points after initial increase). In the RITrep group, the mean sTg levels at day 2 and 14 were slightly elevated compared to baseline (129±45% and 117±91%, respectively) ([Fig. 5], left panel). Clear increases of sTg levels to >250% were observed only in 2/16 patients (13%), whereas in these patients the CEC numbers decreased to <15% of the baseline levels at 1 of the 2 early time points (see individual courses in [Fig. 5]). Fig. 5 Time course of percent changes of CEC and sTg in the RITrep group (mean±SD) (upper left panel). On average, the time course was fairly parallel for the 2 parameters, especially in consideration of the large variability of the data. In contrast, the other panels show 2 patients with clearly diverging results (sTg increase to >250% of baseline levels, CEC decrease to <15% of baseline levels at least at 1 of the 2 short-term time points). Overall, neither of the 2 groups showed a significant correlation between the clinical evidence of response (i. e., scintigraphic, laboratory, or morphologic) and the percent change of CEC at any time point (data not shown). Furthermore, there was no clear correlation between the initial TNM stage or number of involved lymph nodes, thyroid remnant mass or radioiodine uptake on the one hand and the percent change of CEC on the other hand at any time point (data not shown). To explore the potential of CEC changes as early predictors of therapy response, the sensitivity (i. e., the correct identification of patients with clinical progression by a CEC increase) and specificity (i. e., the correct identification of patients with clinical regression by a CEC decrease) were also calculated ([Table 3]). The negative predictive value (npv), i. e., the ability of CEC decreases to predict a disease regression or stability, for CEC changes at day 2 amounted to 90% when referring to the scintigraphic results and to 100% when referring to morphologic and sTg response ([Table 3]). Table 3 Sensitivity, specificity, and negative and positive predictive value of CEC changes in the group of patients with repeated radioiodine therapy (RITrep), with respect to different evidence of therapeutic response (serum thyroglobulin (sTg); scintigraphic; morphologic). A clinical response was defined as regression or stable conditions, progression as unambiguous disease aggravation. In the whole patient population there was no recognizable correlation between the applied radiotherapy activity and the CEC changes at any of the time points investigated (data not shown). In general, all patients showed a therapy response in terms of CEC numbers, i. e., there were no cases in which CEC numbers remained equal to pre-treatment levels. The present study evaluated the effects of I-131 RIT on the number of epithelial cells circulating in the blood of patients with DTC. A specific focus was to monitor short-term effects, to explore the possibility that CEC changes can be an early predictor of therapy response. Given the long half-life of I-131 (8.02 days), clinically measurable therapy effects of RIT are expected only after a certain time, therefore studies on short-term effects of RIT on the thyroid gland and/ or parameters are limited. A retrospective analysis by Bernier et al. has shown that a first RIT was followed by increased sTg levels 5 days after therapy, and that the degree of the sTg increase positively correlated with the later response to therapy . The present study confirmed these results, i. e., a temporary increase of sTg was observed in both study groups, in the RITfirst group more pronounced than in the RITrep group ([Fig. 4], upper left panel). CEC were identified in the blood of both patient groups and changes over time were also observed. Because the CEC changes varied both in extent and direction of the response (increases and decreases), a focus on mean group effects proved insufficient to describe the therapy effects. 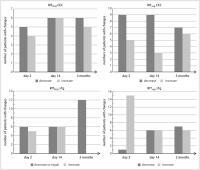 Thus, patterns of response were primarily considered (number of patients with CEC increase or decrease), a procedure successfully employed in previous studies   . Also, the number of patients was too limited to provide statistically robust results, therefore the value of the present study is to provide results useful for the design and sample size calculation of future studies. Contrary to the working hypothesis underlying this study, the course of CEC changes did not parallel the changes of sTg levels, in fact the direction of the response was basically opposite. 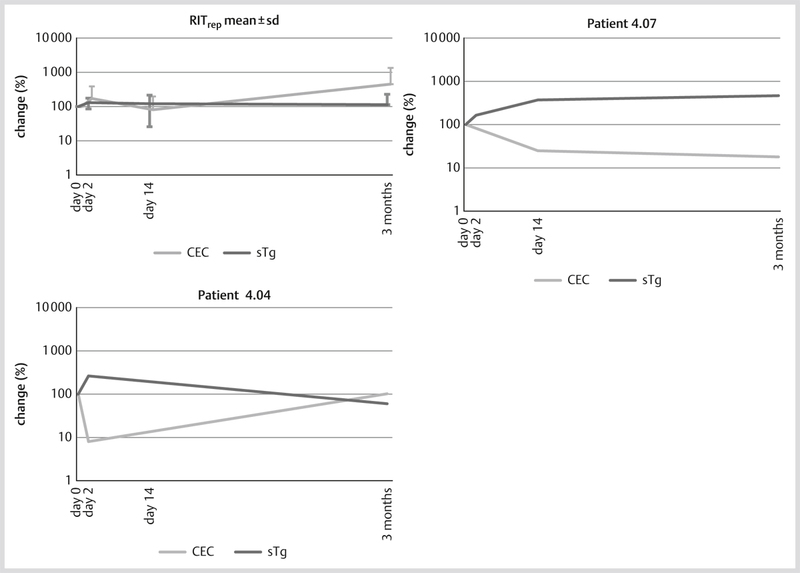 At short-term time points post RIT (day 2 and 14), indeed, more patients of the RITrep group showed a sTg increase in parallel to more patients showing a CEC decrease ([Fig. 3]). Some explanations are possible: The RIT may cause damage to CEC circulating in the blood. Because in this study only vital cells were counted, potentially necrotic cells as a result of RIT targeting were not included in the count. This may explain the general result that most patients had reduced CEC number post RIT compared to pre RIT. Assuming that at least part of the CEC derive from the thyroid  and therefore contain the protein thyroglobulin, higher quantities of this protein can be released in the serum in consequence of cell damage or necrosis. Indeed, studies on protein production at different de-differentiation stages of thyroid carcinoma have shown that thyroglobulin can be detected in most differentiated carcinomas . Thus, an increase of sTg in parallel to a decrease of CEC may reflect an effective targeting of circulating thyroid cells by RIT. In analogy, Duffy et al. have stated that necrosis and apoptosis of tumoral cells are the cause of initial increase of tumor markers after chemotherapy . As a matter of fact, only the patients undergoing repeated RIT showed this type of response. In contrast, nearly all patients of the RITfirst group showed an early increase of sTg, but this was accompanied by similar proportions of patients responding with a CEC increase or decrease ([Fig. 3]). In the RITfirst group, the frequently incomplete surgical ablation of the thyroid gland may result in a reservoir of normal thyroid cells disseminating into the circulation. The number of CEC measured in blood, therefore, may represent a balance between the therapeutic targeting of circulating cells and the mobilization of cells from the residual thyroid tissue ([Fig. 6]). Fig. 6 Schematic representation of possible effects of RIT on blood CEC and on thyroid tissue, the latter either as post thyroidectomy remnant (as for example in the RITfirst group) or as local persistence/distant recurrence (as in the RITrep group). 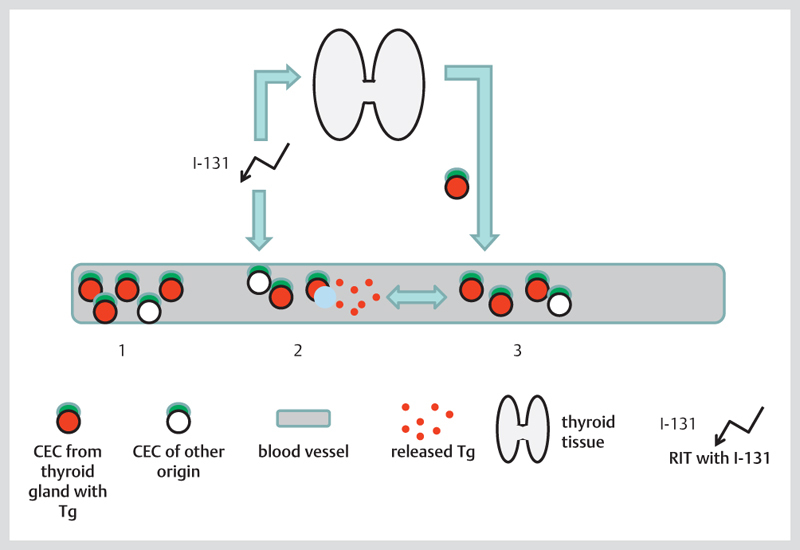 1) Baseline conditions: thyroid-derived CEC containing thyroglobulin (Tg) (in red) and CEC of different tissue sources; 2) In response to RIT, the Tg-containing CEC undergo cell damage or death and release Tg in circulation at measureable levels (serum-Tg; sTg); 3) The RIT targets also normal thyroid tissue, where inflammatory changes caused by treatment lead to overexpression of EpCAM and mobilization of cells into the circulation. The CEC in blood, therefore, do not distinguish between EpCAM-positive carcinomatous cells and inflammation-activated, but benign cells. The balance of these 2 sources may change inasmuch as a predominance of cell destruction causes a CEC decrease and predominance of mobilization causes a CEC increase. If the measured CEC stem from normal thyroid cells (in contrast to stemming from carcinoma cells as hypothesized in the case of patients with repeated RIT), the question arises as to why normal cells express high levels of EpCAM. Indeed, EpCAM does not only function as adhesion molecule, but is also involved in differentiation, proliferation, cell migration, and signal transduction processes. Accordingly, EpCAM is found also in benign proliferative and inflammatory conditions   and, in fact, own investigations have detected CEC also in benign, therapy-requiring thyroid diseases . If this working hypothesis is correct, then CEC in blood may reflect not only malignant thyroid cells but also normal, iodine-avid thyroid cells responding to RIT. The presence of CEC at initial post-surgical stages has already been investigated in breast carcinoma and benign breast diseases. In these conditions, mobilization of benign epithelial cells into circulation in reaction to surgical trauma has been clearly shown, in parallel to the release of long-lived malignant CEC . In the present study, the patients of the RITfirst group had undergone thyroidectomy 4 to 6 weeks before the study, and own studies have shown that the highest number of CEC are actually found in thyroid patients after surgical intervention . Patients with complete thyroidectomy have been found to have thyroid remnants in at least 93% of the cases . Taken together, the previous and present observations suggest that in the RITfirst group the CEC are of thyroid origin (at least in part), that these cells undergo reactive changes in response to RIT, and their numbers in blood reflect a mixture of mobilization and destruction of CEC. However, this hypothesis clearly requires verification in future studies. Using the applied method, it is impossible to conclude the origin of the CEC. They may derive from the thyroid, from thyroid cancer tissue or from a different epithelium (benign or malignant). In cancer patients, it is more likely that these cells represent malignant cells; however, it cannot be proven in this setting. Therefore, it is necessary to develop a method to unambiguously characterize these cells on a single-cell-basis, for example via tissue-specific analyses of CEC and demonstration of their malignant or non-malignant nature via carcinoma-specific markers. This could be achieved by the analysis of the mRNA in these cells. Another possibility is to investigate whether these cells contain the thyroid specific protein thyroglobulin using a fluorescence labelled anti-Tg-antibody, as performed previously by Ringel et al. . The hypothesis of CEC destruction and subsequent thyroglobulin release was corroborated by the course of some individual cases ([Fig. 5]). 2 patients of the RITrep group, in fact, responded with a pronounced sTg increase in parallel to a clear reduction of the CEC (the latter below 15% of the baseline levels), at least at 1 of the 2 early time points. Similar individual courses were observed also in the RITfirst group, where 5 patients reacted with a clear sTg increase in parallel to a CEC decrease ([Fig. 4]). On the other hand, other patients displayed different patterns, therefore other mechanisms are also conceivable. Considering clinical effects, there were no statistically significant differences between the CEC changes of patients with clinical progression or regression (data not shown). However, in the RITrep group it could be shown that – of the patients with a CEC reduction at day 2 – at least 89% showed a good clinical response to RIT (stable or regressing course of disease) at the 3-month check (see negative predictive value in [Table 3]). A short-term CEC check 2 days after RIT may therefore be helpful in identifying patients with a better chance of no disease progression if they show decreasing CEC numbers. This hypothesis must be clearly verified in larger studies. At the same time the specificity of the CEC changes at day 2 post RIT was 67, 67 and 69% (in relationship to scintigraphic, laboratory, and morphologic evidence, respectively), thus definitely not all responders were identified by this method. Furthermore, the positive predictive value (ppv) of CEC numbers must be assessed as insufficient, given that the ppv did not exceed 33% at any time point. Thus, the measurement of CEC is clearly not suitable for the prediction of disease progression. Another limitation of the present study is the assessment of clinical response after 3 months because therapy effects of RIT might last longer than this interval. Recommendations for evaluation of ablation success range from 3–6 months  to 6–12 months . In the present study 3 months as follow-up interval were chose because therapy strategies differed between patients after that time, thus potentially influencing CEC response. This study showed for the first time that the numbers of CEC in DTC undergo changes in response to RIT. The data allow to formulate the hypothesis that the destruction of CEC through RIT may induce a short-term release of thyroglobulin in the blood. However, some patients showed patterns of response that were not compatible with this hypothesis. Also, the sample size was too small to draw general conclusions, however the data provide a valuable basis for the design of future studies. A clear relationship between the clinical outcome and the CEC changes could not be found, but the data suggest that early CEC decreases may help identifying patients more likely to respond to RIT. The early changes of CEC may represent a useful addition to the standard diagnostic checks performed at 3–6 months post RIT. Future studies in DTC are necessary to investigate whether CEC are of thyroid origin and carcinomatous nature. Prof. K. Pachmann holds a patent (no. 7615358) concerning the applied method of detecting CEC, called maintrac®.